Crispy Green: Spring “Fruit to Go” Crispy Fruit Giveaway!!! Spring has spring here in coastal California which means that our life has gotten a lot busier. I have discovered that unless I have easy snacks to grab on the go, I will purchase fast food. I am a sensitive person in the area of food and heat. I hate that chocolate melts in the heat and thus the flavor profile is altered in a minor way. Recently I discovered a healthy, natural snack that is not sensitive to heat in any way – freeze-dried fruit. 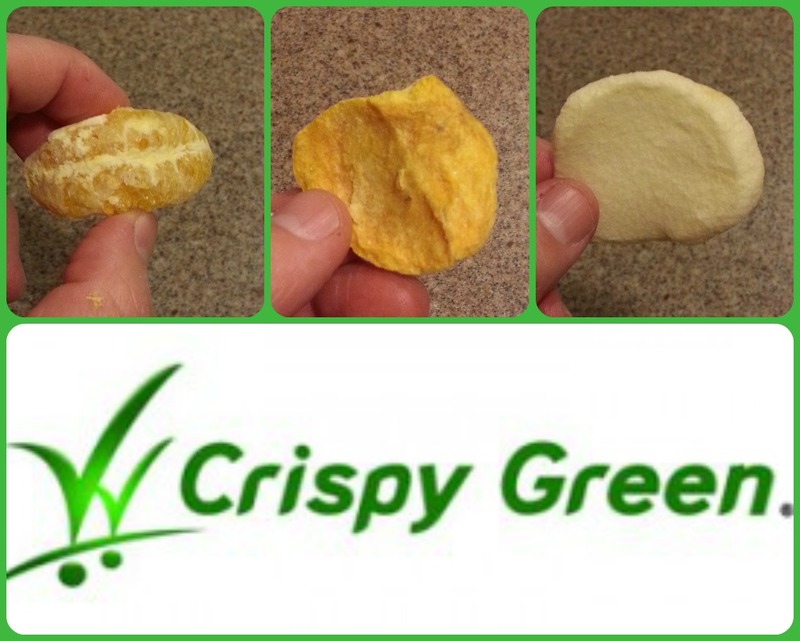 Back in July of 2015 I reviewed a company called Crispy Green and their product called Crispy Fruit – 7/15 review here, yet it did not occur to me at the time that this is the perfect on the go snack. Crispy Green has seven flavors of freeze-dried fruit including Crispy Apples, Crispy Mangoes, Crispy Asian Pears, Crispy Bananas, Crispy Cantaloupe, Crispy Pineapples and Crispy Tangerine. Not only have I tried the Crispy Apples, Crispy Mangoes and Crispy Tangerine but also the bananas, and it is safe to say I am addicted. I love that I can get the benefits of fruit, but not the added expense and added fats as fast food. Since I know I am not the only person busy and on the go this Spring season, I am excited to have a giveaway for you, so you can have a healthy alternative on the go! Think of Crispy Fruit as “fruit-to-go” – it’s the perfect spring travel snack (TSA Approved) and a great way to get your fruit when fresh fruit may not be available or may not be the most convenient option. Click here to read more about this portable snack! GIVEAWAY: Crispy Green is offering a 12 pack of Crispy Fruit to my readers! (3) lucky winner’s will be selected at random to win this 12 pack assortment of fruit and each box will contain 2 bags of Crispy Apples, 2 bags Crispy Asian Pears, 2 bags of Bananas, 2 bags of Pineapple, 2 bags of Mangoes and 2 bags of Crispy Tangerines. This is a $15.58 value! I will be randomly choosing 3 people on April 28th (4/28/2016) to receive this healthy on the go snack! Open to residents in the US only. To enter complete the entries below! Winner will be notified by me by email and prize will be fulfilled by Crispy Green! Remember you have 48 hours to claim prize, or I will choose another winner. GOOD LUCK!!! Crispy Green: Spring “Fruit to Go” Crispy Fruit Giveaway! This entry was posted in Food and Drink Products, Giveaways, Gluten-Free and tagged craft snacks, giveaway, Gluten free, snack food on March 29, 2016 by Jennifer. I’m most looking forward to opening my windows and listening to the birds sing. I am looking forward to everything blooming, opening the house and getting in some fresh air, and most of all, taking my daughter to the park for long intervals without freezing. Normally it would be babying my tomatoes, however this spring we are on work detail. Looking forward to the Azaleas blooming. Getting the garden planted is the best part of spring. I am looking forward to going to Eureka Springs, Arkansas with my hubby & kids this spring for a getaway! I am wanting to get my garden started. I am looking forward to warmer weather, and finally getting to put away my coats! I am looking forward to the nice weather. I’m looking forward to.blue skies and lots of sunshine! I live in Texas and spring means HEAT is coming. All the flowers and warmer weather. I’m looking forward to picnics and BBQs. I’m looking forward to the spring breeze and being able to open the windows and it not be too cold! I’m looking forward to sitting on the decks of our bayside cafes. This Spring, I’m most looking forward to the warm weather. I am looking forward to being warm. I’m looking forward to starting my garden. Just today I passed some jasmine in bloom on my walk, so one of my favorite things about spring is definitely the flowers. flowers for sure! thanks so much for the chances to win. I am looking forward to the green grass and pretty flowers! Love all the best Spring has to offer with hope of a successful garden! Just the warm weather – it just won’t stay! I’m looking forward to really nice weather. I am looking forward to warmer temperatures.